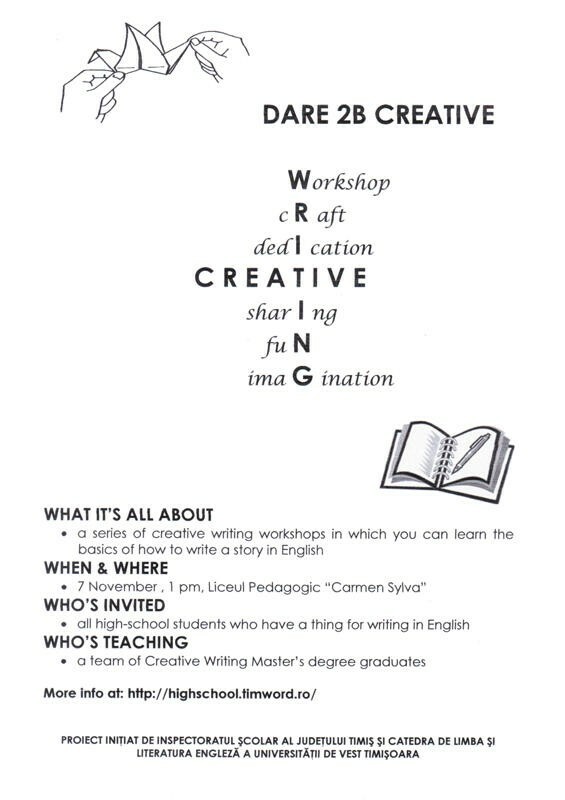 The “Dare 2B Creative” course comprised a series of up to ten creative writing workshops for high-school students in Timiş County. The course aimed to offer the students the possibility to explore their creativity and imagination, as well as to practise and improve their writing skills in English. The workshops and subsequent events were organised by students and graduates from the Creative Writing M.A. at the University of the West Timişoara, coordinated by Lecturer Claudia Doroholschi, PhD, and Mihaela Gheorghiţă, working in close cooperation with English Inspector Delia Secula from the School Inspectorate of Timiş County. The workshops, focusing on short-story writing, usually began in early November and ended by mid-March. They dealt with the basics of fiction writing, ranging from character and plot development to the effective use of various writing techniques. The tutors were Creative Writing M.A. students or graduates. The workshops took place every other Saturday afternoon at the “Carmen Sylva” Pedagogic High School in Timişoara. The course was free and welcomed all high-school students in the county. In the past we had students not only from Timişoara, but also from places as far as Lugoj, Buziaş, Deta, Gătaia, Peciu Nou and Sânnicolau Mare. At the end of the course, the short stories the students write were registered in a competition judged by Creative Writing M.A. students or graduates, other than the tutors. Their task was to select not only a few winners, but also the most effective stories to be published in a collection. The project began in the autumn of 2005 and continued until 2009. The publication of the students’ stories every year was possible with the generous help of the Local Council of Timişoara. Tutors and jury members: Alexandra Anton, Adina Baya, Delia-Alina Contrea, Ramona Dobrei, Mihaela Gheorghiţă, Alexandra Anca Jivan, Mirela Lăpugean, Simona Nicorici, Mihaela Pănuş, Gabriela Tucan.